The Grand Lodge of Pennsylvania's former Grand Secretary of many years, Thomas W. Jackson has received untold awards, titles and accolades over the years, but this is a first for him. He is depicted on a new official postage stamp of the nation of Brazil, and solely in his capacity as a Freemason. I'm not talking about the kind of customized stamp you can have your grand kids or pet terrier printed on for your Christmas cards. I'm talking about a real live, national bureau of engraving-style, printed by the Casa da Moeda do Brasil, no-kidding postage stamp. I don't even remotely pretend to know the first thing about philately, much less read Portuguese, so if anyone wants to chime in with more information, feel free. I did look over their postal service website (Correios) enough to know that any social or philanthropic group is welcome to suggest a subject for depiction on a stamp. The local newspaper in Tom's home town of Shippensburg, Pennsylvania posted a long interview with him yesterday in which he describes his many travels during his 16 years as the Executive Secretary for the World Conference of Masonic Grand Lodges. The position also gave him the opportunity to engage in his other passions of hunting and fishing in very exotic places. I recall seeing Tom get off of an elevator at Masonic Week one year and I asked him what he had coming up. He replied that he was scheduled for heart surgery in the coming weeks and he hoped for a fast recovery, as he was planning to go big game hunting in Africa about 10 days afterwards. He's truly unstoppable. The avid fisherman and hunter said he's been working for many years in trying to bring Brazilian Freemasonry together. “There are three different Masonic groups, and although they relate to each other, they don’t acknowledge each other or recognize each other, and I’ve been working for years to get them rectified,” he said. 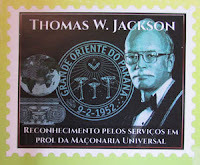 Jackson had attended a Freemasonry conference in Brazil last month, and on the conference’s last day, June 24, leaders presented him with the stamps as a symbol of their appreciation. 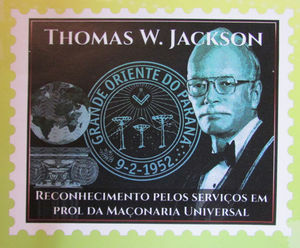 On the stamp, it says in Portuguese that it is in recognition of his service in promoting universal Freemasonry. Jackson is known across the globe in Freemasonry circles, a fraternal organization celebrating its 300th anniversary of its formal creation this year. Two rooms in Jackson’s home are filled with an array of medals that have been given to him over the years. Many of the items are in a room that has dozens of mounted animal heads, such as buffalo he hunted in Australia and Botswana. He said the position took him to many countries. He didn’t know how many countries he has visited, but his wife of more than 50 years, Linda, keeps track by placing red pins on a world map at their home. Jackson noted he has visited all 50 states in the U.S. and all Canadian provinces. Jackson added he has met the presidents of Portugal, Chile, Romania, Mozambique, Mali, Gabon, Chad, and Congo. He has also met former U.S. President George H. W. Bush. “In eastern Europe and Africa, they want to meet with me to find out what contributions Freemasonry can make to their developing societies,” he explained. He noted the executive secretary position didn’t have a salary, but his expenses were always covered. Jackson also said he mediated disputes over the years, such as the three Freemasonry groups in Brazil. He said he has been fortunate to be able to mediate, and the key to the discussions is trying to listen to reason. Jackson stepped down from the position in 2015, but he still gets calls to travel somewhere to advise on a situation. “I’m supposed to be retired,” he said, with a laugh. “When I stepped down as executive secretary, I thought now I’ll be able to spend time on my farm. It hasn’t happened yet. 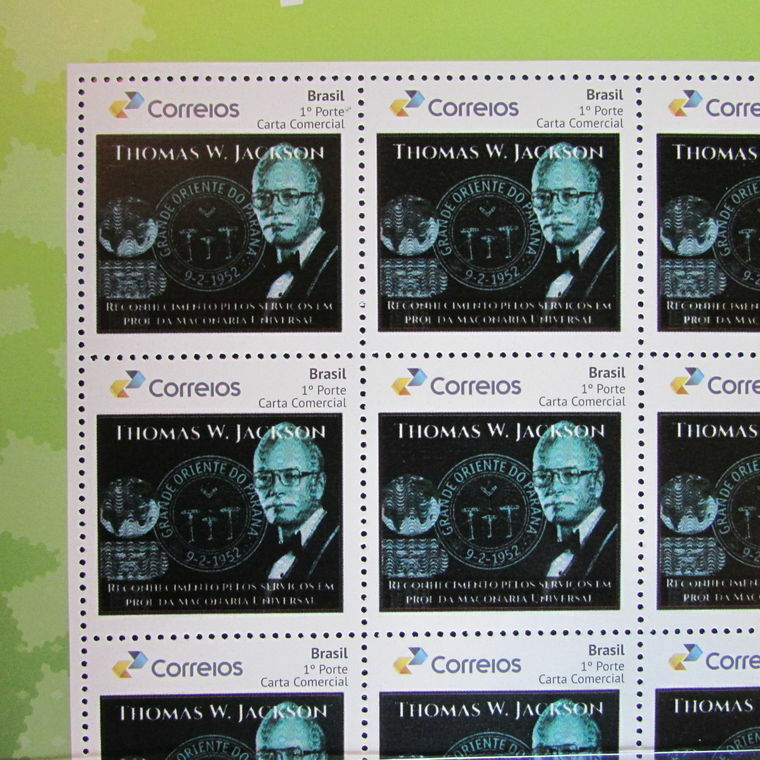 I would like to buy a sheet of these stamps. How do I go about purchasing?